Tuesday, May 9th is National Teacher Appreciation Day and we here at Dig-It! 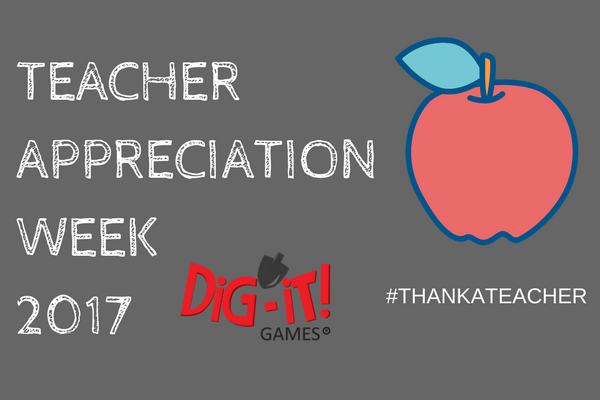 Games have a host of teachers to thank! We not only have to thank teachers who use our games in their classes but also every teacher who has taken the time to fill out one of our surveys, has play-tested our games individually or with students and every teacher who now stays up to date on game-based learning by following us on social media. We are an educational video game company and we would not exist without you! We recognize that there are many things piled on the proverbial plate of teachers from the state, the district, parents, students and your own personal drive to ignite learning in your students. That is why we also recognize that the teachers who are seeking out video games to incorporate into the daily routine deserve recognition and appreciation. We know that the choice to seek out a game that fits your class is motivated by seeking to facilitate an engaging experience for your students. You want to ignite a spark of creativity, wonder, excitement or even an emotional experience. In short you want to create a class that impacts your students. We say thank you for your drive to make your class the best it can be. Choosing a game takes time. You must find a game that connects to your curriculum and play it long enough to determine if it hits the learning objectives you have mapped out for your class. We know that time is in short supply and we thank you for playing our games! Once you have chosen a game that fits your class, there will need to be some customization of your lessons to connect it to your curriculum. We offer curriculum materials for many of our games but we also know that you will always customize them to fit your students’ needs. We thank you for building the bridge between our games and your students. 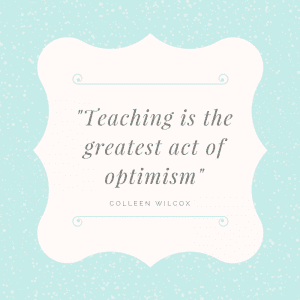 Teaching is all about logistics! We know that choosing the game and scaffolding the lesson is only a part of a successful incorporation of a game into a course. You may also have to secure the laptop cart, reserve the computer lab or at a minimum make sure all your devices are fully charged and student accounts established. These steps can sometimes be time-consuming and tedious but absolutely necessary. We thank you for making sure that students can access our games in your class! During game playing you may also have to troubleshoot. Thank you! When the laptops are closed and students have left your classroom, your work is not done. You will look at data reports on how students did while playing the games or devise assessments that incorporate game-play to show what students have learned and also to help justify your decision to use games in the classroom. We thank you for taking this extra step! These steps demonstrate that incorporating games into the classroom is not a simple process but we know that you do it because you want to create an experience for students they will never forget. We say thank you! In the spirit of Teacher Appreciation Day, we would also like to say thank you by offering you one of our games of your choosing for free and a chance at becoming a character in a video game! Use code TEACH2017 at our game store. Fill out this form and we will randomly pick 3 entries to have our amazing art team draw you (or a friend) as a video game character that you can use to put on social media, letterhead, posters around your room, you name it! Don’t forget about our free materials on TeachersPayTeachers! Reach out to us on Twitter @dig-itgames! Take a moment now to fill out an entry form today! If you are chosen to become a video game character we will contact you for a personal photo for reference. Good Luck!